November and December events clearly show that Russia's policies towards Belarus are dictated primarily not by economic considerations but political. Russia is willing to spend billions of dollars in subsidies to keep the status quo in Belarus. The European Union, on the other hand, is more and more busy with its own problems, the most important of which is the crisis of the Eurozone. In the coming year, Russia will increase the amount of economic support to Lukashenka's regime. Apart from the significant discount in the gas price, the Belarusian side will benefit from refining larger volume of Russian crude oil. The next day after Beltransgaz was sold to Gazprom in November, the Belarusian flags were taken off flagpoles near the buildings of Beltransgaz' agencies. The flags of Russia and Gazprom remained on the flagpoles. A few days later Chairman of Gazprom Alexey Miller came to Minsk to annouce that the salaries of Beltransgaz' staff (the company was renamed to Gazprom Transgaz Belarus) would be tripled. A new posh office of the company with a ultra-modern gym would be built. Mercedes Benz cars would be bought for the senior staff of the company. The charity program "Gazprom to Children" will be expanded to include Belarus. 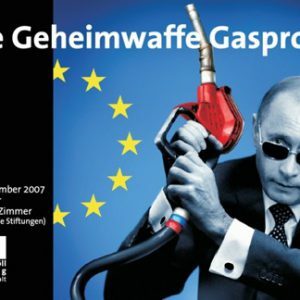 According to Gazprom, Beltransgaz' losses in 2011 amounted to about USD one billion. Even if we consider that these data may be inaccurate (Gazprom had an interest to understate Beltransgaz' profitability before buying it), and Gazprom's plans to increase the gas transit through Belarus to 44,5 billion cubic meters, a threefold increase in salaries of Beltransgaz' staff is not justified from the business point of view. According to Miller, Putin himself ordered to triple the salaries of Beltransgaz' staff. It was a political and not an economic decision. The Russian leadership wants to use Beltransgaz as a platform for sending a signal to the Belarusian society that the staff of the enterprises bought by Russian companies will receive much higher salaries and get a better benefits package. Miller did not announce any personnel replacement in the Beltransgaz management. In early December, General Director of Beltransgaz Uladzimir Majorau made a number of statements about the company's activities in 2012. The Russian leadership wants to send a signal to the Belarusian directorate: if their enterprises are bought by Russian companies, the top management will retain their posts and will gain in salary, they will drive new Mercedes. Besides, Russian partners always turned a blind eye to how their Belarusian colleagues pull their ranks, because this is how they use to do it in Russia. The purchase of Beltransgaz by Gazprom will have consequences not only for the relations between Belarus and Russia. Russia gets a guarantee that a union of transit states – Belarus and Ukraine – will never be created. There was a time when the possibility of emergence of such a union worried the Kremlin a lot. Now, Russia is able to stifle Belarus and Ukraine one by one. The web site Regnum.Ru, which publishes articles written by political analysts close to the Kremlin, describes the following sequence of actions of Russia in regard to Belarus and Ukraine. Three years later, when the discount for the gas price under the agreement of November 25 expires, the Russian side will significantly increase the gas price for Belarus. Lukashenka will have to sell major Belarusian enterprises. Typically, they work for the Russian market, and get their components and raw materials from Russia. They will be bought only by Russian companies. The special gas price will be given only to those Belarusian enterprises, which will be sold to Russian companies. The Russian ruble will be introduced as the national currency in Belarus. The Russian military presence will be expanded. Lukashenka will retire and give up his chair to an appointee of the Kremlin. The Nord Stream pipeline will be used at full capacity. The pumping of gas through the territory of Belarus through the newly Russian pipeline will be increased to a maximum. Ukraine will have to sell its pipeline system to Gazprom. It will create additional opportunities for the Russian economic expansion in Ukraine. Regardless of what fate is meant to Ukraine by Moscow, the Belarusian issue is seen by many Russian analysts as closed: sooner or later, Russia will get everything it wants from Lukashenka. To achieve this end Russia is willing to spend billions in subsidies, which will make Belarusian economy increasingly dependant upon its eastern neighbour. On December 15 in Moscow, an agreement was signed between the Ministry of Energy of Belarus and the Ministry of Economic Development of Russia on crude oil deliveries to Belarus in 2012. Russia agreed to supply 21,5 million tons of crude oil in Belarus by pipelines, or 3,5 million tons more than in 2011. Already back in late November, Russia's ambassador Aleksandr Surikov said that the Russian side was not considering the possibility of reducing the size of the bonus for the Russian oil companies, which supplied crude oil to Belarus. In accordance with the agreement of December 15, the size of the bonus for the Russian oil companies was reduced down to USD 20 to 40 a ton. The Russian party has met the wishes of Belarusian officials, concerning another important issue. Over the recent years, the Belarusian government repeatedly asked Russia to get back to the so-called tilling-based operations of Belarusian refineries, all in vain. According to the schemes, Russian companies supplied crude oil to Belarusian oil-refining plants and received petrochemical products in return. Applying the schemes, both the Russian oil producing companies and the Belarusian refineries used to gain significant profit for a long period of time. The treaty of December 15, 2011 provided for the possibility of applying the tilling-based operations again. The sum to be gained by Lukashenka regime in 2012 due to signing the oil supply contracts remains unknown. Commenting upon the negotiation results, the ‘Belnaftakhim’ concern management stated that the contracts provided for the most profitable conditions of oil supply from Russia for the recent five years. Economists have grounds to state that broadening of cooperation between Belarus and Russia in the oil refinery field has certain economic reasons. Thus, the number of cars is rapidly growing in Russia. Consequently, the eastern neighbour lacks petrol and diesel fuel. However, political motives are apparently present here to this or that extent too. The author mentioned in the previous report that the Kremlin’s significant overpayment for ‘Beltransgas’ was politically reasoned. An independent Belarusian economic expert Leanid Zaika noted that according to his calculations Lukashenka regime would get around USD 3 billion of Russian subsidies, due to the discounted gas price in 2012. The contracts of December 15th can also be regarded as a lavish Russian new year present to Lukashenka regime. Following the statements, delivered by Lukashenka and the Prime-Minister of Belarus Mikhail Miasnikovich, as well as according to the official documents, the governmental authorities count on using the funds to cover the foreign debt in 2012. The public expenses, including a part of welfare programs will be cut down at that. Also, the salaries of budget staff and pensions will be increased insignificantly next year. Lukashenka looks more optimistic than the government. As soon as there appeared information about the outcome of negotiations on oil supply in Moscow on December 16, 2011, Lukashenka stated that it would be realistic to reach the positive balance of foreign trade in the amount of USD 1.5 billion in 2012. Moreover, Belarus received a loan from the Savings Bank of Russia (Sberbank Rossii) and the Euroasian Development Bank in the amount of USD 1 billion on December 15, 2011. The First Deputy Minister of Finance Uladzimir Amaryn noted that a significant part of the loan could be transferred to the Belarus’ gold and foreign exchange reserves. The Prime-Minister Mikhail Miasnikovich stated that according to the reached agreements, the Savings Bank of Russia would issue extra USD 4 billion of loans for implementation of various projects in Belarus shortly. On 16 December two Belarusian citizens were added to the EU visa ban list, and EU assets of three companies associated with the Belarusian regime were frozen. The European Union continues to impose different sanctions on Belarus at the request of human rights activists. However, this policy fails to provide the EU with additional leverage in the country. Today the EU can neither offer Belarus the prospect of EU membership nor significantly increase the amount of Eastern Partnership funding. If the Union wants Belarus to be more pro-European, it should try to develop a new engagement policy as Russia is steadily increasing its influence in Belarus with far-reaching political and economic consequences. The Russian state is interested in gaining control over Belarus' economy and it has been coming closer to realizing this task step-by-step every year. Recently Gazprom became the owner of 100% of the shares of Beltransgaz – the Belarusian national gas transit pipelines operator. On 8 December Gazprom CEO Alexey Miller promised Beltransgaz employees a threefold increase in their salaries at the request of Russian prime minister Vladimir Putin. Russian policymakers are trying to buy the loyalty of Belarusian citizens and convince workers of other Belarusian enterprises to “fight for joining Russia”. Putin made this statement on 1 August when he was answering question about the possibility of the Belarusian and Russian people to live in a united state. Russian bankers are actively penetrating into the Belarusian banking sphere. Now they exercise control over 7 of 32 Belarusian banks: BPS-Bank (owned by Sberbank), former Mezhtorgbank (owned by Alfa-bank), Belgazprombank (owned by Gazprombank), VTB-Belarus and Bank Moscow-Minsk (owned by VTB), BelRosBank (owned by Rosbank) and Belvnesheconombank (owned by Russian Vnesheconombank). Apart from the widespread penetration of Russian TV channels in Belarus, Russian businessmen also possess certain Belarusian mass media assets: leading Belarusian business and political newspaper “Belgazeta” and popular daily “Komsomolskaya Pravda” (Grigoriy Berezkin), Planeta journal (Gazprom), satellite TV and internet operator “Kosmos-TV” (Victor Vekselberg), newspaper “Argumenty i fakty” (Alexey Ananyev and Dmitry Ananyev), Interfax-Zapad (Mikhail Komissar). Russian businessmen have also bought almost all the leading insurance companies of Belarus: TASK (Sberbank), Belvneshstrakh, Belingosstrakh (Oleg Deripaska), Brolli and Alvena (Sergey Sarkisov and Nikolay Sarkisov merged these two companies into “Belrosstrakh”). They also possess significant assets in the leading leasing companies (VTB-Leasing, BPS-Leasing), gambling business (Shangri La casino, Columbus), construction (Itera, Su-155), pharmaceutical industry (Ferain-Bryncalov), restaurant business (Il Patio, TGI Fridays), mobile retail (Euroset’, Sviaznoy) and milk industry (Unimilk). Construction of Polatsk Hydropower Plant and the first Belarusian nuclear power plant is also led by Russian companies (Rosatom and Rostechnologies). Moreover, in November Russian oligarch Mikhail Guceriev was granted the right to construct a new potash processing plant in Belarus named “Slavkaliy”. All these facts clearly demonstrate that while the European Union is trying to put on pressure, Belarusian policymakers adjust their foreign policy and investment priorities without any significant changes in its internal politics. Some opposition groups appeal to the Western community to ban the 2014 World Hockey Championship in Minsk, and urge the withdrawl of Western companies and investments from Belarus. 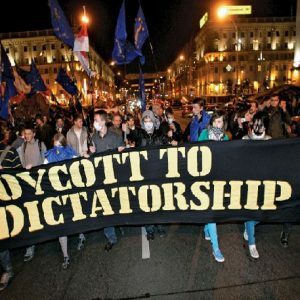 They also demand to stop any cooperation between Western corporations and institutions with Belarusian authorities and companies (as in the case of Deutsche Bank and BNP Paribas). Ironically, none of the groups picket Russian embassies or Gazprom offices although it is Russia which provides billions in economic subsidies to the Belarusian regime while Western investment in Belarus is almost non-existent. The "pro-isolation" group within the Belarusian opposition hopes that pressure on Belarusian authorities will contribute greatly to the democratization of Belarus through the fall of the regime or alterations in its behaviour. However, the authorities want to keep their grip on power without changing their policies, so they simply ask Russian counterparts for help. And they do get this help in exchange for further concessions on economic and political sovereignty of the country. Nowadays there is a very popular thought among the Belarusian opposition that Lukashenka uses the argument for the strengthening of Russian influence in order to intimidate Western policymakers and manipulate Western public opinion. Nevertheless, this logic still works: the more Western countries prefer to isolate Belarus, the more Russia gains control over the Belarusian situation. When there are no competitors to determine the future of Belarus' economy and politics, Belarusian assets lose their value and Russian businessmen can easily buy them at lower prices. This is just business and market laws in action. Following the creation of the Eurasian Economic Union, it is extremely important for the European Union to offer convincing incentives for Belarus and Ukraine or at least not to impede European companies and NGOs from working with Belarusians. Russia is not a much more democratic country than Belarus, but the European Union considers it as one of its main partners in a globaized world. The existence of large private independent media outlets, international organizations, international business and international investments in Russia prevents its leaders from a final crackdown on its civil society and opposition. The same situation could be true in Belarus. Lukashenka is just a functionary of the Belarusian political system that is shaped by different variables. When Belarusian exports to European countries surpassed the amount of Belarusian exports to Russia, Lukashenka began to behave more friendly towards the EU. Of course, he is prone to cooperation with Russian leaders who are more similar to him in terms of their mentality and policies. However, when he understands that collaboration with the West is beneficial, he becomes less radical in his statements and actions. There were no political prisoners in Belarus from September 2008 to December 2010 when Belarusian authorities believed in the will of Western states to significantly support the Belarusian economy. On 30 November Russian Ambassador to Belarus Alexander Surikov expressed Russia's interest in privatizing the Belarusian Naftan and Mozyr oil refineries, as well as Minsk Automobile Plant (MAZ). Earlier Suleiman Kerimov wanted to buy the biggest potash manufacturer in the CIS, Belaruskali, for 15 billion US dollars, but Belarus was dissatisfied with the price offered, so the issue has been put off for now. Consider also that Russian mobile service operator MTS opted out of buying the state's 51% stake in one of three Belarusian mobile service operators – MTS Belarus. Does Russia Want or Need to Incorporate Belarus? Russia does not need to annex Belarus as it would provoke tension on its borders, international condemnation and discord with such an action. However, with the large amount of control exerted over the Belarusian economy and its military potential, in the future it is not unforseeable that Russia could create in Belarus a puppet government controlled by the Kremlin, which will significantly influence Belarusian internal and foreign policy. When Russia reaches this point, it will defend its Belarusian assets and rulers as its own, which will make it even difficult for the West to influence politics and human rights in Belarus. If the European Union wants to determine something in Belarusian politics, it needs to strengthen its lobby and economic presence in Belarus. It also needs to offer the Belarusian population, businessmen and civil society encouraging incentives to be pro-European. Europe can dramatically liberalize its visa regime, offer better opportunities in education such as the recently launched Open Europe Scholarship Scheme and encourage Belarus participation in the Bologna process and should not be afraid to deal with Belarus.